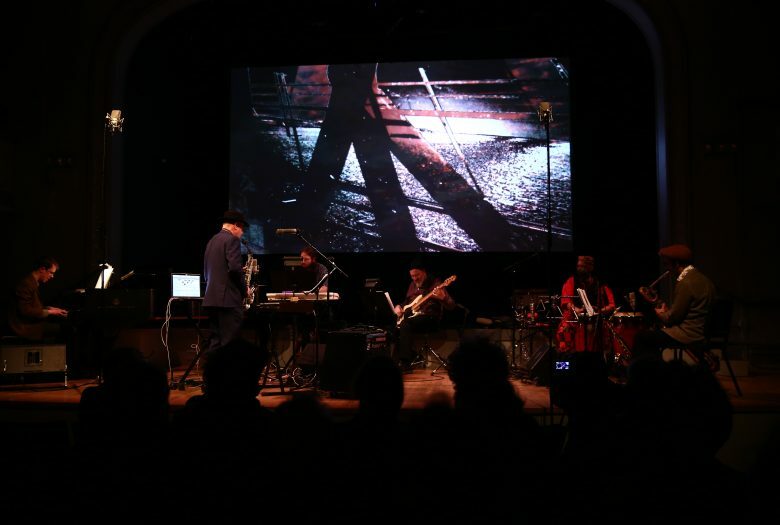 Long-standing collaborative duo and live performance pioneers, video artist Kit Fitzgerald and composer Peter Gordon return to Roulette with the world premiere of their new work, Frozen Moments of Passion. In this piece, natural and abstracted imagery—including Fitzgerald’s signature, transformative video paintings—are created, processed, and mixed live and alchemized with Gordon’s sax and piano. Singular moments are frozen in time, visually and sonically, extending into the sublime. Accompanying the composer in his musical ensemble is Gavin Rayna Russom—reknowned lead synthesist of the acclaimed LCD Soundsystem—on modular analog synthesizer, Michaël Attias on saxophones, and Max Gordon on synths and keyboards. Kit Fitzgerald is a video artist and director working in live video performance, single-channel video, and installations. Her work utilizes small hand-held devices and large studio configurations, drawing, and processing. She pioneered video as a performance medium in the 80’s with collaborators Peter Gordon and Max Roach at LaMama, BAM Next Wave Festival, Lincoln Center, Aaron Davis Hall, and opera houses and theaters abroad. Other collaborators include choreographers Donald Byrd, Bill T. Jones, Yoshiko Chuma; musicians Ryuichi Sakamoto, Ned Sublette and Matt Mottel; poets Bob Holman, Ann Waldman, and Seiku Sundiata; and theater companies The Talking Band, Northern Netherlands Theatre, and The Wooster Group. Her most recent work includes music videos for DFA and OGenesis Records as well as video performance and projection design for Arthur Russell’s Instrumentals directed by Peter Gordon at the Sydney Festival, Primavera Festival, MoFo Festival in Tasmania, and venues throughout Europe. Fitzgerald has directed award-winning documentaries on art and culture. She has exhibited at the Whitney Museum of American Art and Museum of Modern Art and has twice been in the Whitney Biennale. She has been awarded commissions from Tokyo Broadcasting, NHK, and SONY Japan, and won prizes at international film and television festivals. Her work is distributed by Electronic Arts Intermix, New York. Composer, saxophonist, and producer Peter Gordon moved to New York in 1975, where his Love of Life Orchestra first gained attention at downtown venues such as The Kitchen, CBGB, Max’s Kansas City, and the Mudd Club. An early proponent of the recording studio as a compositional tool, Gordon produced recordings for LOLO, as well as Robert Ashley, Arthur Russell, Rhys Chatham, Laurie Anderson, Jill Kroesen, David Van Tieghem, and “Blue” Gene Tyranny. He was music producer for Robert Ashley’s video opera Perfect Lives, as well as the recent Spanish-language version, Vidas Perfectas (presented at The Whitney in 2014.) Gordon has an ongoing collaboration with video artist Kit Fitzgerald, and he has composed four operas. A composer of scores for theater and dance, he has earned an Obie Award and a Bessie Award. His film/tv credits include Joe Versus the Volcano, Desperate Housewives, Déjà vu and The Deuce; the New York Philharmonic performed his orchestrations for Michael Tilson Thomas’ Thomashefsky Project; collaborations with Lawrence Weiner include films, the single Deutsche Angst, and the opera The Society Architect Ponders the Golden Gate Bridge (Berlin/Bonn 2000). A friend and frequent collaborator of the late Arthur Russell, Gordon has toured Arthur Russell’s Instrumentals at international festivals. Gordon’s recordings include Star Jaws (Lovely Music 1978), Extended Niceties (Lust/Unlust 1979), Geneva (Lust/Unlust 1980), Casino (Italian Records 1982), Innocent (CBS Masterworks 1985), Brooklyn (CBS 1986), Leningrad Xpress (Newtone 1992), Love of Life Orchestra: Quartet (Newtone 1995), The Yellow Box, with David Cunningham (Piano Records 1995), Love of Life Orchestra (DFA 2010), Beachcombing w/Factory Floor (Optimo 2012), Symphony 5 (Foom 2015), Same Language, Different Worlds (Ogenesis Records 2016), Condo (Foom 2017), and EIGHTEEN (Foom 2018). Gordon is Professor of Music at Bloomfield College. Gavin Rayna Russom is a New York based multimedia artist and composer of electronic music. Using the analog and digital synthesizer, she has produced a body of extremely influential art and music over the last 15 years. Much of her work is informed by her deep relationship with the analog synthesizer, a tool she has applied herself to not only as a composer and player but also as a designer and builder since 1999. As someone who had never been comfortable in the fixed ideas which surrounded gender and all of the social frameworks that accompanied it, the possibilities of music and specifically analog synth electronic production were a critical way for her to engage with the outside world and still be authentic to her internal world. Part of Rayna’s vision is to combine the rigorousness of academic music and art—and its serious intentions to transform culture through its ability to communicate spiritual ideas—with the world of the club where these connect to real people’s daily lives. In addition to recording and performing music, she also creates the visual elements for her work including installations, music videos, record covers, costumes, sets, and props. Rayna is a current member of LCD Soundsystem with whom she recently completed a two and a half year world tour in support of their number one album American Dream, followed up by a DJ tour with bandmate Nancy Whang as The Ladies of LCD Soundsystem. She is one of National Sawdust’s Artists in Residence for 2019 and will perform new work there several times through the season. Rayna came out as a trans woman in 2017. Michaël Attias is a saxophonist/composer based in New York City since 1994. As a leader, he has released seven critically-acclaimed albums, most recently the 2017 debut of the Michaël Attias Quartet, Nerve Dance. As a sideman, he has performed and recorded all over the world alongside some of today’s most original and compelling musicians. Attias has also composed and designed sound in New York and at various regional theatres. He was named a 2000 Artists’ Fellowship Recipient of the New York Foundation for the Arts and was awarded MacDowell Arts Colony fellowships in Fall 2008 and Summer 2016. Max Gordon is a composer and musician based in New York City. Recent composition credits: The Winter’s Tale (TFANA, NY Times Critic Pick), Charles Perry (Verve Records) and collaborations with hip hop choreographer Jennifer Jancuska. He has worked on the Broadway music teams of The Band’s Visit, The Cher Show, and Tootsie. He is a lifelong student of Peter Gordon and Kit Fitzgerald.